Many Catholics invoke this Trinitarian Prayer multiple times a day in blessing themselves. 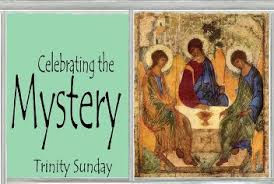 This Sunday is a celebration of the mystery of the Most Holy Trinity. The thing about mysteries is that they are mysterious, unknowable. Attempting to fully understand this mystery is like trying to fit the ocean into the thimble of our mind. Our readings for today give us a glimpse into this mystery of who is the Holy Trinity - three distinct persons in one God. Our Gospel reading (John 16:12-15) is an excerpt from Jesus' farewell discourse to his disciples at the last supper. Jesus was preparing them for the days to come within the limits of their understanding. In this brief passage we find embodied the Father, the Son and the Holy Spirit. "Jesus said to his disciples: 'I have much more to tell you, but you cannot bear it now. But when he comes, the Spirit of truth, he will guide you to all truth. He will not speak on his own, but he will speak what he hears, and will declare to you the things that are coming. He will glorify me, because he will take from what is mine and declare it to you. Everything that the Father has is mine; for this reason I told you that he will take from what is mine and declare it to you.'" In our first reading from the Book of Proverbs (Prov 8:22-31) we hear of the mysterious creature Wisdom, who was there before the beginning of creation. Some scholars have thought Wisdom in this passage to represent Jesus and / or the Holy Spirit. "Thus says the wisdom of God: 'The LORD possessed me, the beginning of his ways, the forerunner of his prodigies of long ago; from of old I was poured forth. . . . When the Lord established the heavens I was there, when he marked out the vault over the face of the deep; when he made firm the skies above, when he fixed fast the foundations of the earth; when he set for the sea its limit, so that the waters should not transgress his command; then was I beside him as his craftsman, and I was his delight day by day, playing before him all the while, playing on the surface of his earth; and I found delight in the human race.'" In our Epistle reading (Romans 5:1-5), St. Paul explains the fruits of our relationship with the Trinity - God the Father, God the Son, Jesus and the Holy Spirit, the essence of the perfect love between the Father and the Son. "Brothers and sisters: Therefore, since we have been justified by faith, we have peace with God through our Lord Jesus Christ, through whom we have gained access by faith to this grace in which we stand, and we boast in hope of the glory of God. Not only that, but we even boast of our afflictions, knowing that affliction produces endurance, and endurance, proven character, and proven character, hope, and hope does not disappoint, because the love of God has been poured out into our hearts through the Holy Spirit that has been given to us." By our human nature, God has given us the desire to understand the unknowable, to come closer in relationship to our Creator, to fill the "God-shaped" hole in our heart. Our readings today help us understand that it is the Holy Spirit, the presence of Jesus that draws us closer to the Father. We find this presence in no greater place than in the Eucharist. Receive it.